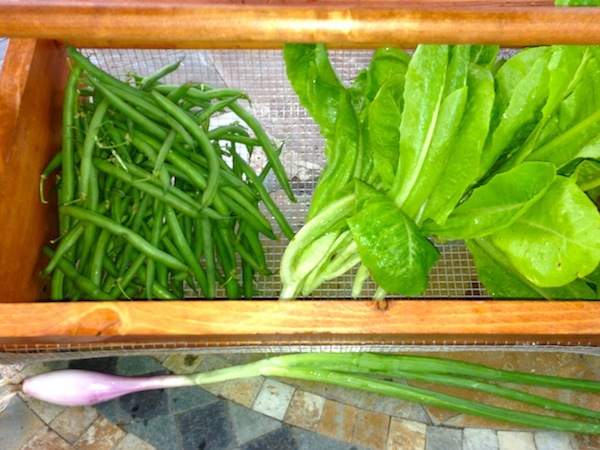 Green onions, snow peas, kale, radish, spinach. 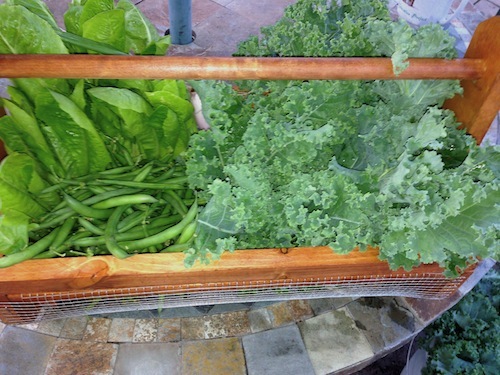 I also took a small bucket of cold water to the garden along with the harvest basket. As I cut parsley, it went directly into the bucket along with Flashy Trout Back lettuce. 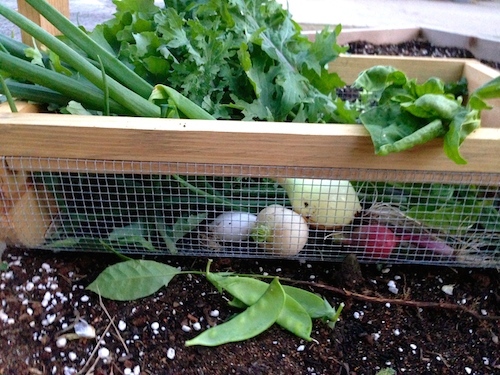 The tender young leaf lettuce and the last of the garden peas seem to be the baby bunny rabbit’s favorites as well. It won’t be long before it’s time to pull the onions and garlic. The recent rains has been a big help. Everything is growing fast. 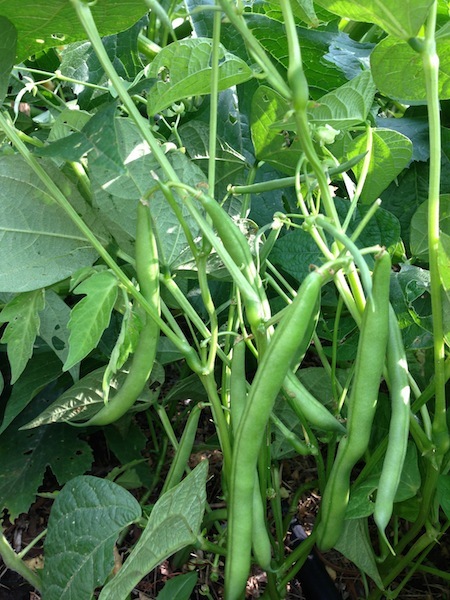 The snow peas will be a stir fry with the last of the asparagus and shrimp. 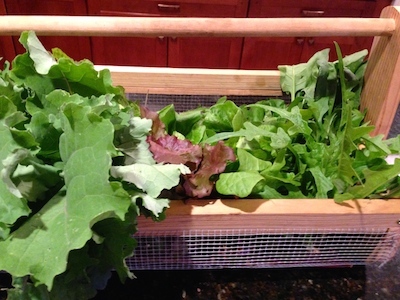 Today’s Harvest Basket 6/1/14 Picked a few baby butter head lettuces and lots of leaf lettuces like Flashy Trout Back, Oakleaf, Garden Ferns. It’s wilted lettuce on tonight’s menu. Patsy Bell Hobson. Picked lots of Russian Kale “Wild Garden Frills” (seed from Renee’s Garden). Despite being wild, it’s also quite mild. Tore up some small leaves to add to our salad tonight. Will use the rest in a green rice dish. Picked a few baby butter head lettuces and lots of leaf lettuces like Flashy Trout Back, Oakleaf, Garden Ferns. There are onions and radishes picked yesterday, so it’s wilted lettuce on tonight’s menu. 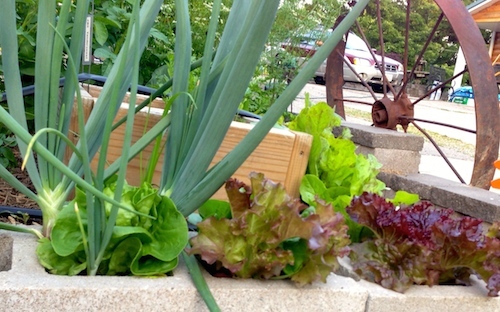 It’s just too bad that we can’t have home-grown lettuce and tomatoes at the same time. Usually lettuce comes to an end about the time cherry tomatoes start coming on. A broken transplant or starter tomato might have been a disaster. 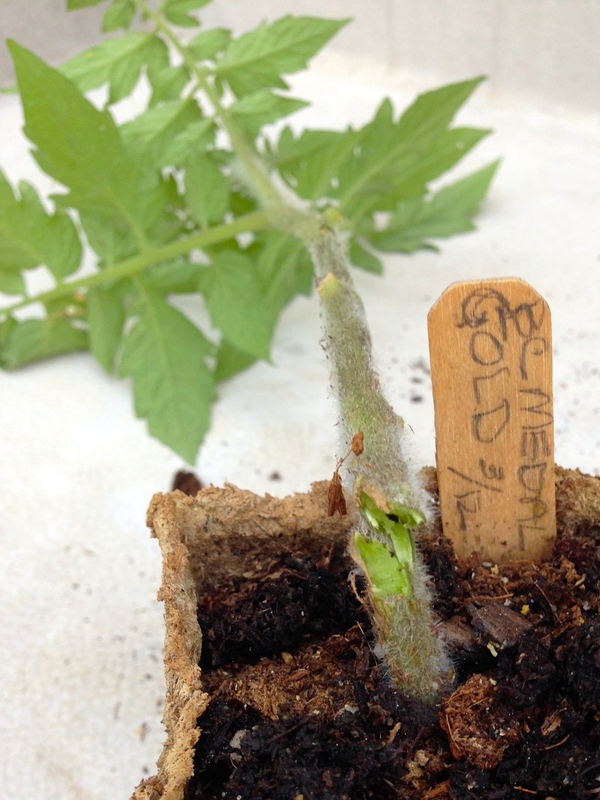 Tomato plants want to live. All you need to do is stick the broken stem in the ground and plant the rooted base. Don’t forget to keep these starts well watered and protected from the hottest sun until till they are well rooted and starting to branch. It will be the same as planting two tomato plants. Meaning double the tomatoes as planned. This tomato is Gold Medal, a big old heirloom producing 1/2 to 1 pound size yellow globes with red streaking. The salad has no recipe, just combine basil, tomato and mozzarella. drizzle a bit of olive oil and a sprinkle of salt.